Summer monsoons are our favorite time of year here, but this year, they have been quite a bit different. 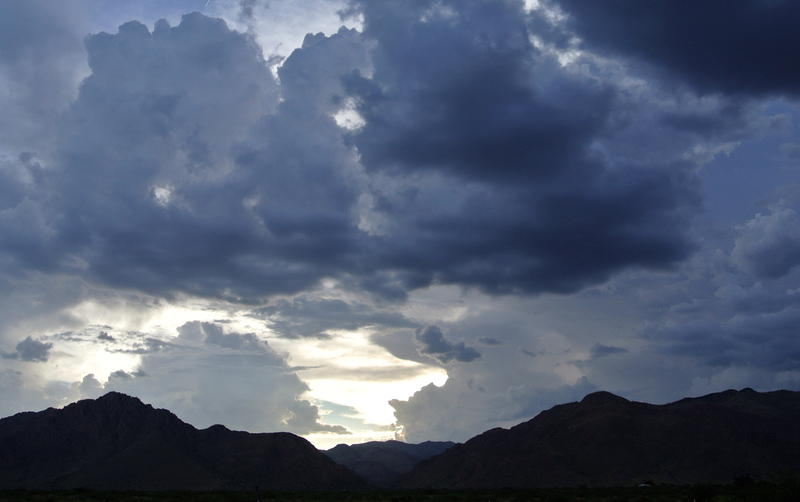 For the last ten years, we have seen monsoons always start within a day or two of July 4. This year, they seemed to start much sooner. We got a few good rains in early June and thought “This is the early monsoons!” Then nothing. The folklore here is that early monsoons mean a weak monsoon, and we feared this was the case. But then in mid July, we started getting good rains. We have had in the neighborhood of 1-2″ in a 24 hour period at least three times in the last month. That’s really good rain for us (and the rains have been strong enough that we’ve had to repair our road a couple times already, and there have also been a few lengthy phone/Internet outages). However, the pattern of the storms this year has been quite a bit different. In past years, the classic monsoon pattern has been for clouds to build up over the mountains to the west of us, to move from west to east, and to dump rain (somewhere, not necessarily on us) in the later afternoon or early evening. This year though, storms have come from every direction, and the movement has sometimes been from south to north or north to south or even east to west. There have been several times we’ve watched the radar to see storms making a strange swirling pattern around some random center. Also the timing of the rains has varied. Several times we’ve had rain in the very early morning (2am) or even in the mid-day. In general, I’d say we’ve had less frequent rain here at the house, but in bigger quantities when it comes. The storms have been more violent, and we’ve had hail a couple times. And as of today, August 6, the monsoons are still going strong. Knock on wood that they have a few more weeks. All of this has felt rather unusual. I’m not sure what all this means, but I’m recording it here for posterity and future analysis. Anecdotal evidence is still evidence, especially when recorded promptly so that some (other?) researcher can combine it with similar data to identify trends. Hello from the hot and relatively dry east coast.